I have promised to share some recipe's on the blog this year and this first one is super healthy and cheap! Take your drained can of Butterbeans and blitz them in your choice of blender (I use a stick blender). Add your lemon juice, crushed garlic clove and Chilli Powder (you can leave this out and add some black pepper if you don't like Chilli). Slowly add your Olive Oil until it forms a smooth dip. You may need to add a little more or less to get a consistency you like. Serve with your choice of crudites....that's vegetable sticks for us common folk! Suggestions - Carrot, Celery, Pepper, Tomato, Cucumber, Radish, Baby Corn, Mangetout....or have all of them and get your 5 a Day! I like to add a pitta bread sliced into batons too and enjoy it as a healthy lunch. This amount of dip costs under a £1 to make and once you have the ingredients ie. Olive Oil, Garlic, Chilli Powder you can use them to make lots more! 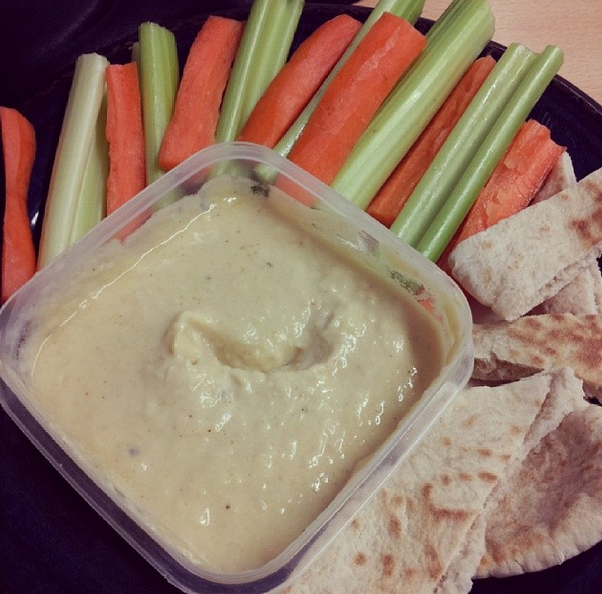 Here's a secret.... you can use the same recipe with Chickpea's to make Houmus*! *please note I never have and never will know how to spell it...Hummus, Houmous, Hoomouse?? ?